Pluto 5 is a survey vessel which has returned to the Moon’s orbit after a journey of several years. After they fail to respond to hailing calls Theroux is sent up to investigate. A macabre sight awaits him – all eight members of the crew are dead, and they now resemble little more than mummified corpses. Pluto 5 was owned by Hanimed, a multinational drug company who are a generous sponsor of space research. They send one of their junior employes. Dr Anna Shoun (Sayo Inaba) to investigate. A the same time, Krivenko is concerned about Christina Janssen (Dawn Keeler). Janssen is a respected research scientist working in isolation who hasn’t responded to any calls for the last sixty hours. Nathan is persuaded to investigate, but he’s too late – Janssen is dead (and in circumstances similar to the deaths on Pluto 5). When Nathan learns that Janssen has a connection to Hanimed it seems to be far too much of a coincidence. He believes that Anna might be able to uncover the truth, but her fierce loyalty to Hanimed makes her vetry reluctant to betray any confidences. In Warm Blood was the first of three consecutive scripts written by John Collee. It’s a decent effort, although there’s no real mystery to the story. The connection between Hanimed, Pluto 5 and Christina Janssen is established very early on – so it’s not difficult to work out the way the plot will develop (especially when taken in context with a news clip which mentions that Janssen had previously been criticised for using unsuspecting people as guinea pigs in medical trials). Sayo Ibaba isn’t terribly good in a rather unrewarding part, since Anna is painted as a literal, humourless, one-dimensional character. She’ll have a few nice scenes over the closing three episodes but she’s easily the most superfluous of the regulars and had the series been commissioned for a second run it’s easy to imagine Anna would have been quietly dropped. The scenes aboard the Pluto 5 are nicely shot by Graeme Harper, who manages to ramp up the tension and claustrophobia as Anna, Kenzy and Theroux investigate the stricken vessel. 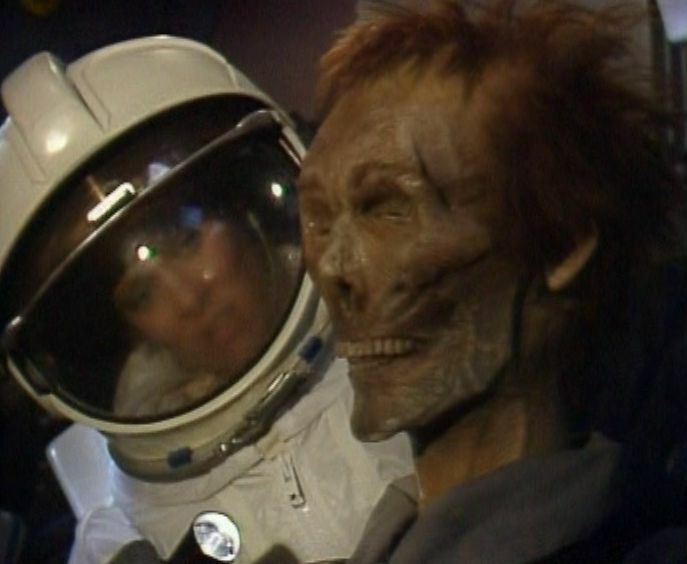 The realisation that one of the crew members is unaccounted for is the setup for a classic horror-movie shock as the decayed corpse makes an unexpected appearance! Even though the body count in this episode is quite high, there’s still quite a humourous edge to the story. Colin Devis is primarily used as comic relief, although his casual racist attitude towards Anna, whilst in character, is somewhat wince-inducing. Another strange move is Nathan’s decision to send him to infiltrate Hanimed HQ back on Earth. Devis is many things, but an undercover operative he is not. As in previous episodes, Star Cops seems to operate in a world where the internet doesn’t exist. Nathan wants the inside scoop on Hanimed, so he has to send Devis to their building in order to tap the main computer (nowadays, of course, somebody would just gain remote access). His brilliant plan for gaining access to Hanimid’s inner sanctum also has to be seen to be believed – he boldly strides up to a visual recognition screen and claims to be Richard Ho. Ho is the president of Hanimed and it’s fair to say that nobody would ever confuse the two. Devis gets himself arrested and Nathan is forced to go Earthside. This leads into a very decent climax, which sees Nathan and Ho (Richard Rees) clash. Nathan now knows that it’s a Hanimed drug which is responsible for the deaths and he convinces Ho that he’s spiked his drink with the same drug. It’s a very maverick cop approach, but it does gain results (even if in real life you know that Nathan would be, at best, suspended for pulling such a stroke). Calder’s top-notch in this scene as he mercilessly baits the unfortunate Ho. Anna finds herself out of a job after passing information to Nathan, so he offers her a job with the Star Cops. Like Devis, she had nowhere else to go – but only time will tell whether she’ll make a good Star Cop or not.